Christmas is just around the corner and the spirit and joy of this probably one of the most important festivities of the year is spreading fast. If you are from northern countries you might wonder how different is the preparation period for Christmas. Well keep reading and we will tell you when and what is done in order to prepare for the celebration of the year in Spain! Preparations for Christmas in shops and malls start straight after Halloween. However, the decorations, ornaments, sweets and other Christmas related things can be already bought at the end of September. Despite that, Christmas in Spain is way less commercial than in other countries. We can tell that you will not find half of the store filled with Christmas decorations that’s for sure! When it comes to the towns, cities and villages preparation for Christmas, it starts at the beginning of October. Hangings of decorations and installations take time and preparations are going on all the way until the end of November when all the lights are turned on. Yes, you read it right the Christmas lights in Spain are light in late November. For some of you, this should sound super late and shocking! Since Spain is Christian Catholic country, Churches form part of the preparation period. Since Spanish people, in general, are very religious churches get packed when Christmas is approaching. As a result, more masses are held in order to make sure that all who wants can celebrate this period of the year in a religious way. Snow, Fir tree, frost, ice skating, hot chocolate, warm wine, Christmas lights sound like typical attributes used to build the spirit of Christmas, especially in the Northern countries. However, what one can expect to experience during the preparation for Christmas in Spain? Although Snow is very rare in Spain some towns and cities around the country try to make it happen. Yes yes, you hear it right! Artificial snow and suds are used to create extra magical period and make the waiting for Christmas even more fun. Belen, a nativity scene is must attribute of Christmas not just in churches, main squares but also in every home. If you haven’t seen one make sure to see one of the most beautiful ones: Belén Monumental de la Catedral de Sevilla (the Giant Cathedral Nativity Scene of Seville), La Luz del Belen en Valencia (The light of Belen in Valencia), Pessebre a la Plaça Sant Jaume Nativity Scene en Barcelona (The Nativity Scene at Plaça Sant Jaume in Barcelona). Although Belen is considered to be the most important symbol of Christmas in Spain, Christmas trees and Christmas flowers are present as well. At least one Christmas tree is placed in the town, city or village and more and more often people are placing Christmas trees in their homes next to Belen. In addition to this, Christmas flower called poinsettia found in Levante or in the Canary Islands is a typical symbol and decoration of Christmas. Its bright red and green colors are exactly what gives the vibe of celebration. Although the Christmas lights in Spain are turned on late in comparison to northern countries, there are many of them around main streets, historic towns, main squares all around the country. In addition to the lights, loudspeakers are placed in order to raise the Christmas Spirit even more. 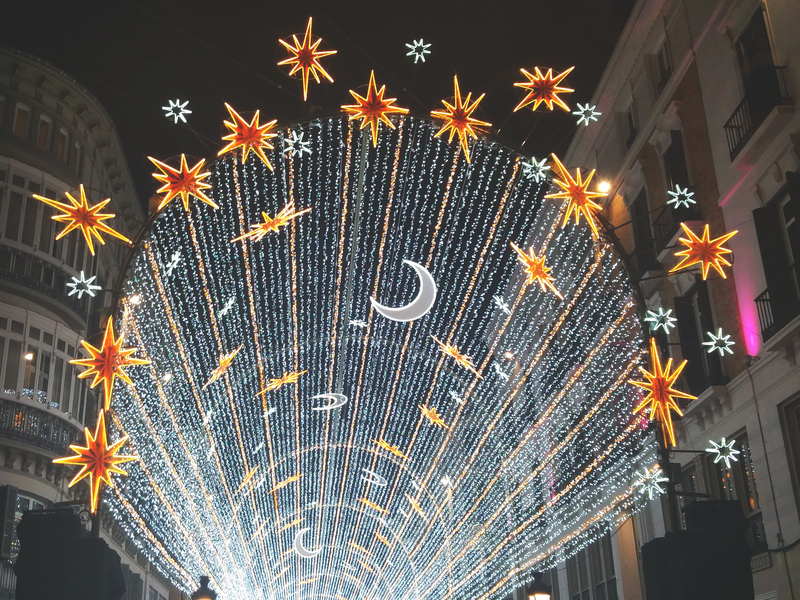 In some cities such as Malaga, lights and sounds shows are taking place during the entire period of preparation and festivities. Christmas markets also a must for each town, city, and village of Spain. Here you can find Christmas Tree decorations, flowers, hand-crafted souvenirs and gifts, Christmas sweets, Belen statues and many more typical products being sold. Apart from shopping Spanish Christmas markets are offering little performances such as Christmas carols, dances, theatre performances, and many activities for little ones. Christmas market Fira de Santa Lucia which takes place in Barcelona outside the cathedral is probably the oldest, it is held since 1786. Christmas Markets at Plaza Mayor in Madrid, Feria de Belen of Seville, Bib-Rambla in Granda is definitely worth mentioning too. One more thing cannot be missing during this time of the year! It is a lottery. So-called ‘El Gordo’ (the Fat One) is the biggest lottery not only in Spain but also in the world. Every year there are thousands of winners as a result traction to buy the ticket is huge. The draw of the winners takes place on December 22, making this date the second most important day during the pre-Christmas period. The list of pre-Christmas activities can go and on and skip it is nearly impossible while in Spain. Thus, if this time of the year is your favorite you definitely going to have a blast!